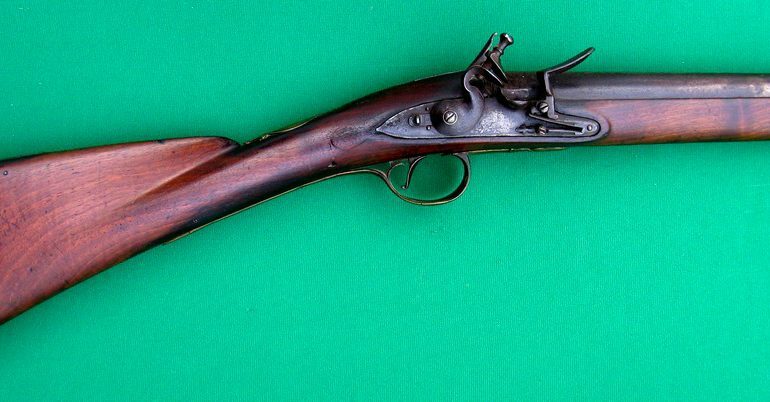 The British Short Land Pattern musket, part of a series of muskets that were the standard for British forces for well over 100 years, was a .75 caliber, flintlock, smoothbore musket weighing in at about 10.5 pounds with an overall length of 58.5 inches. It was manufactured with a barrel 2 inches shorter than the Long Land Pattern musket, primarily from 1740-1797, at which point the India Pattern became standard for the British infantry. Its initial use was by Dragoons in 1740, and became the infantry standard in 1768. A 17″ triangular bayonet could be fixed to the front, making the weapon stand over 6 feet tall. 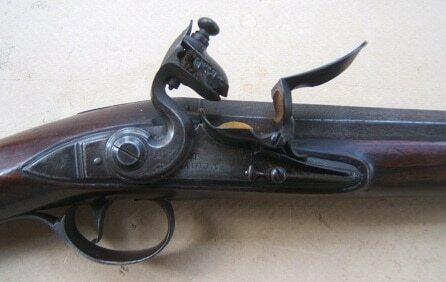 This model firearm was used by both the British and Continental soldiers during the Revolutionary War. For more details, visit here.